Raising Chickens in Your Backyard – Locally Raised? Have you heard the latest news out of Papillion, NE? In the heart of the Midwest Papillion’s city council has voted down 6-2 that residents aren’t allowed to raise chickens in there backyard! Can you believe that? In the middle of the heartland local governments are dictating what people can and cannot raise on their land. It’s almost like the land isn’t ours. Hmmm. Luckily, I don’t live in Papillion, and am not under these same regulations. Recently, I’ve become really good friends with one of my neighbors who owns a small acreage about 2 blocks from my house. My kids love going to visit the “farm”, which has goats, cows, a horse, a swing set and most importantly chickens. “Daddy, can we go feed the chickens! !” <– I hear about 5 times a day. Part of me thinks I love going over there more than my children, which is probably because I was raised on a farm. Needless to say my boys are getting a little taste of the farm in our backyard, and having fun at the same time. if I went in on that with you, and split the costs of the chickens?” Farmer: “Sure!” And that was the start of me and my family raising chickens for eggs. Raising chickens in suburban Omaha is a treat. 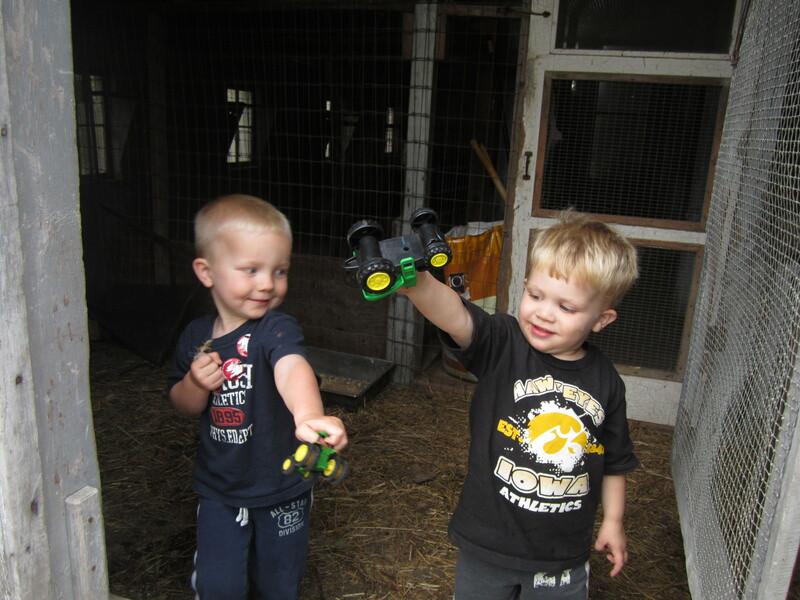 It gives my boys a taste of the farm, but yet we still like 15 minutes from downtown Omaha. My neighbor has been awesome in allowing me and my family to raise chickens on his farm, and I’ve worked a lot to clean up the chicken coop pens, and improve the outdoor netting of the chicken area. Either way, we are both improving each other circumstances in much the same way that people offered up services or bartered during the Great Depression. Nesting area – make sure you have a good nested area for the chickens to lay their eggs. Chickens like are area with matted hay, and somewhat enclosed area (feels like home to them). Feed – we use a mixture of ground up corn, and protein pellets to feed the chickens. Chickens are also good at eating kitchen scraps, and especially old vegtables. Water – ensure that refill your water daily and clean out the pan/watering jug. Coverage from predators – have plenty of protection for the chickens so that no predators get in. This could be anything from coyote, cat, badger, or raccoon. If you don’t have a covered fenced in area, then consider putting your chickens in the coop every night. 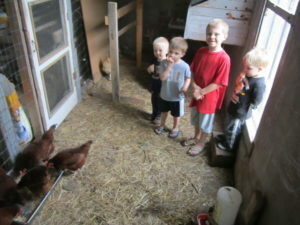 Overall, my son’s and I have really enjoyed raising our own chickens and gathering eggs on a daily basis. In a way, it is teaching them where their food comes from and how they can have a hand in locally raising their own food. With our family raising our own chickens now it make me think of the following video from the video series, Portlandia. Have you seen it? Hilarious series that takes place in Portland Oregon, and gives you a little glimpse of how serious the hippies are in Portland of buying organic. Check out this short clip! Do you raise chickens? What are some tips you have or use? Would love to hear from some of our readers. We may be offering this “raising chickens” as a series, so let us know your interest. Does Cub Foods Really Have Lower Prices? We’ve thought many times of raising chickens … we even have a barn and a fenced in area! But I hesitate at the time commitment. We like to travel two or three times a year and what would we do with the chickens? I also cringe at the thought of trudging out to the chicken coop every morning in the winter. Your arrangement of raising your chickens in cooperation with the neighbor farmer sounds ideal. The fresh eggs sound even better! I can understand bans in more populated areas, but if you have a decent sized area of land then there is no reason for the ban. I have always lived in a city so I have never been a farm animal owner.